ATTENTION CUSTOMERS: THIS AIR-TITE MAY SHIP LOOSE, OR WE MAY INSERT YOUR COINS INSIDE THE AIR-TITE. WE CANNOT GUARANTEE YOU WILL RECEIVE THE RED PACKAGING. When you invest in a proof, bullion, or uncirculated coin, you want to know that your coin is protected now and in the future. 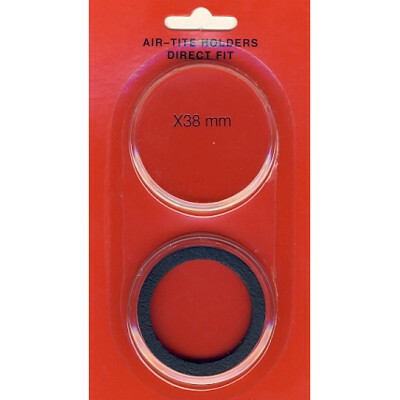 Silver.com is proud to offer this 38 MM Air Tite coin holder with gasket to help you protect your investment from damage. The Air Tite coin holder with gasket available in this product listing fit a wide variety of coins, such as US Silver Dollars struck before 1978, the 1.25 oz. Canadian Silver Bison, and the popular Silver Maple Leaf coins. These holders have a diameter of 38 MM and come with a black inner gasket that seals your coin within the Air Tite case. Silver.com is devoted to customer service. If you have questions about this product, a Silver.com associate will be glad to help. You can reach one of our team members on the phone at 888-989-7223, online through our live web chat, or via email. Fits: 1.25 oz Canadian Silver Bison Coins, Silver Dollars (Pre-1978), Silver Maple Leafs, Engelhard Prospector Rounds (1982-1987).